When I’m not knitting or genealogy-ing, I like to fix up vintage sewing machines and sew with them. 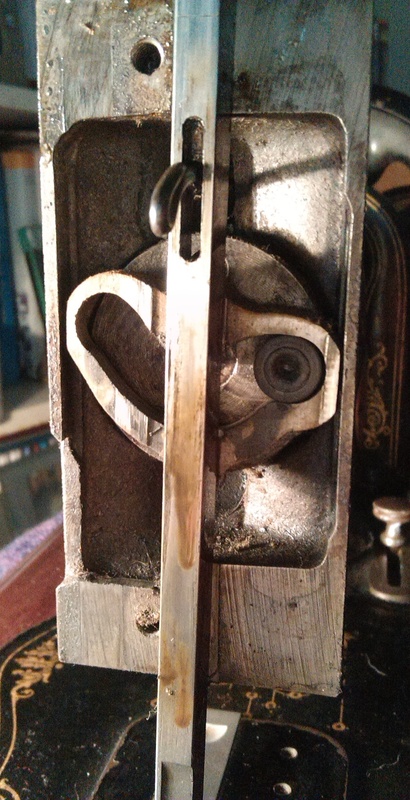 I spent some time, earlier this year, fixing up Victorian/Edwardian hand crank machines; £11 – £15 car-boot bargains; a Singer 28K and a couple of Jones Family C.S machines. Vintage, metal machines have none of the built-in obsolescence of modern, electronic machines with their dodgy plastic gears and starting-frying-the-day-you-pick-it-up circuitry. In fact, they were intended to be serviced and even fixed by the owners if anything dropped off or went wrong. Mechanically, they are so well built, there is very little to drop off or go wrong. Most I have seen have just needed a new needle, a clean and oiling. My own old treadle machine which was stored badly, was another story. That took 18 months of jiggling, threatening, and soaking in a rust-freeing agent, to bring it back to life. Our car boot machines were pretty, had no sentimental value, so were good to learn on. Now they’re cleaned and fixed, I’ve passed them on to my adult sons and one of my son’s friends. Once I got the hang of how to strip down, clean and fix up machines, I started looking round for an ‘interesting’ and older machine to play with. Funds are limited – that’s a polite way of putting it – but I sold a couple of things on eBay to finance it and the same week, along came a 1956 Singer 221K and a 1885 Singer 12K. Sewing machine afficionados will know a 221K (“Featherweight”) is a much prized thing. 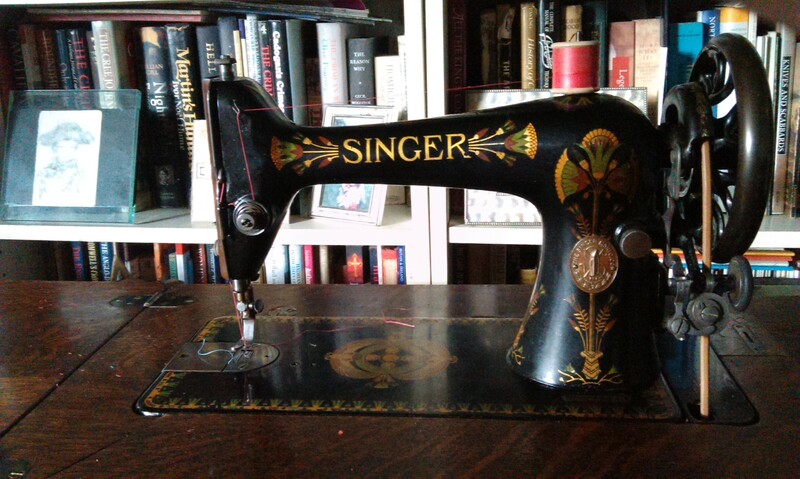 They were made in several Singer factories from the 1930s-1960s. British ones were made in Kilbowie, Scotland. 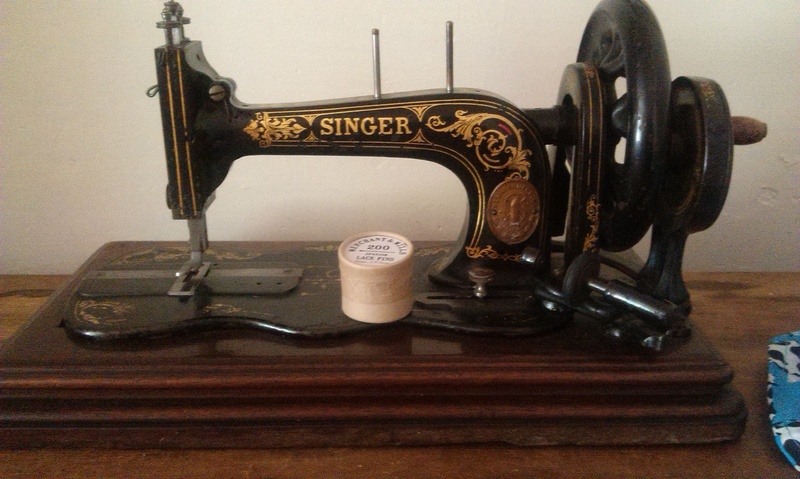 As was my 1885 Singer 12K. 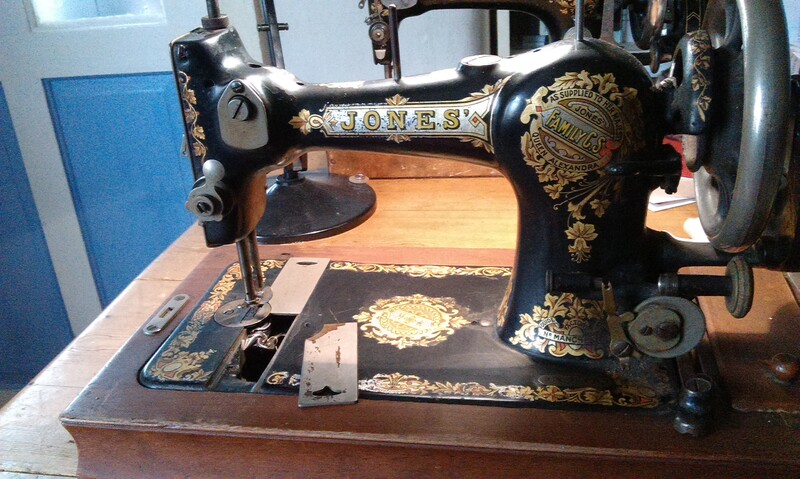 Sewing machines were developed from around 1851. But the first truly popular Singer was the 12. Those made in Scotland are designated “12K”; the “K” for “Kilbowie”. The 12K was patented in 1861, so although mine dates from 1885 it is essentially the same as one made during the American Civil War. I got mine for a stupidly cheap price. 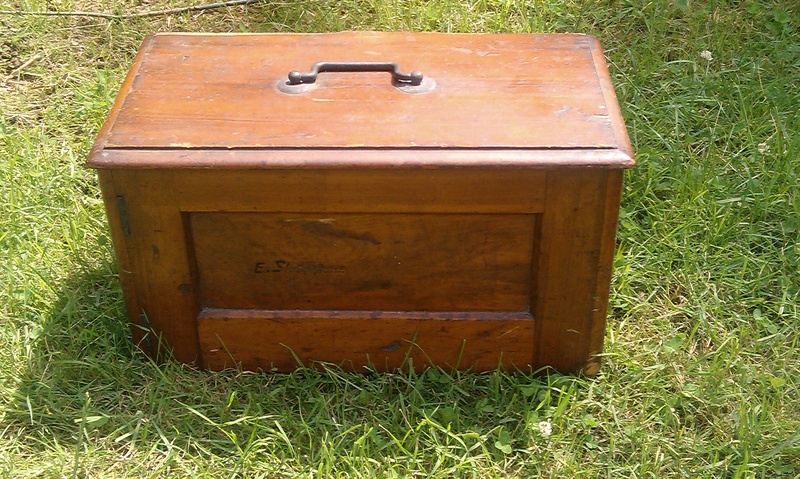 I thought if I could fix this machine up, I could even make some later 19thC living history kit, using it. Research online told me it took an unusual – and expensive at £5 a pop – needle. Also the shuttle is odd – you have to tension it by snaking the bobbin thread in and out through a series of holes and it’s very much trial and error which threading pattern works. Manuals for old Singers can be downloaded online for free. The 12K manual is here. The seller was not into sewing, so couldn’t even tell me if there was a bobbin in so he thought not. He said he couldn’t open the slide plates, to see. I just wanted a fiddle-base old sewing machine. I knew a replacement shuttle and one bobbin might set me back almost as much as I paid for the machine, and the bobbin winder in the picture looked bizarre, so that might need replacing too… but I was happy with that bargain price. It came in its original case with two rusty, ancient keys attached. The case alone is a piece of cabinet maker’s art; the machine, when it’s unlocked, slides out from the case. I was thrilled to get the case too, as research online told me it was original. I expected this machine to have some bits missing and maybe the mechanics would be seized like this 12K’s. It looks distinctive compared to the later, more common vintage machines with its japanned face plate and balance wheel. When it came, it took very little brute force to free up the throat plate and discover it not only had an immaculate shuttle inside, but one lone bobbin as well. That was a few quid saved! I bought a spare needle and bobbin from Helen Howes , who sells old sewing machine parts at a very reasonable price and gives excellent advice, too. All the bright-work was rusted – as you can see in the Before and After shots, I managed to get the worst of it off. On the day the machine came, with a pair of keys tied to its rusty handle with a nasty piece of nylon twine, I wondered if the ancient lock would even work, and whether we’d even be able to get it out of the case. Even though the seller on eBay must have, as he’d photographed it. But with one turn of the key, it slid out of the box no problem. Amazingly, the machine was not seized – just a bit sluggish. The feed dogs still moved; the presser bar still worked; the needlebar was not frozen in time like my own 66K had been. This is a machine so ‘obsolete’ – and ‘ugly’ by mid twentieth century standards if beautiful by our’s – that you can bet it has spent most of the past 70 years or so in an attic. It was dirty, sure, and full of dusty cobwebs underneath – but the decals were in better condition than we’d expected, and a bit of mild, soapy water and some cotton wool buds followed by a gentle polish on the paintwork with sewing machine oil, soon had it looking clean again. I carefully dismantled enough of it to clean inside. I always think of the people who used a machine decades ago, when I find the lint in the bobbin race, and the few remaining threads on the bobbin. In this case a rather fetching vivid purple silk seems to be the last thread ever used. I wonder what it made? This machine may have been quietly put aside as long ago as pre WW2. I have cleaned up several old machines now and never had a receipt forgotten in a drawer, or any provenance so expected nothing to get my genealogical teeth into, with this. 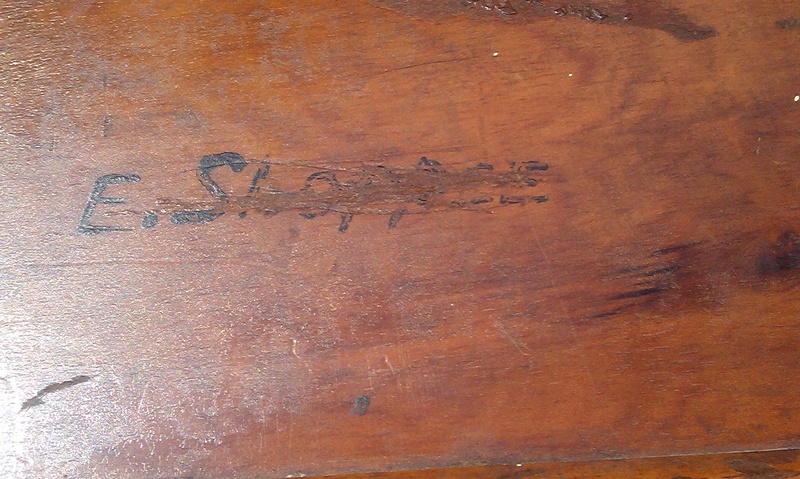 But when we looked at the old case, with a view to cleaning up the wood, there was some writing, so heavily scored out we could barely decypher it, in black ink or paint on the back side of the case. It hadn’t shown up in the eBay photos. It appeared to be a name. I used Maas metal polish on the machine’s bright-work and Parker & Bailey’s Orange Oil Polish to clean up the wood. Both are US products, available for an arm and a leg at Lakeland, in the UK. I cleaned very gently over that writing, in case I damaged it. I didn’t. And out in the daylight there we saw, under all the crossing out, the name “E. SHOPPEE”. It took a while to figure it out. I wasn’t even sure “Shoppee” was a name. Maybe s/he wasn’t the first owner, but the chances were, an “E Shoppee” owned the little 12K somewhere round the back end of the nineteenth century, as the machine was still new and valuable enough for her to want to emblazon her name all over it. 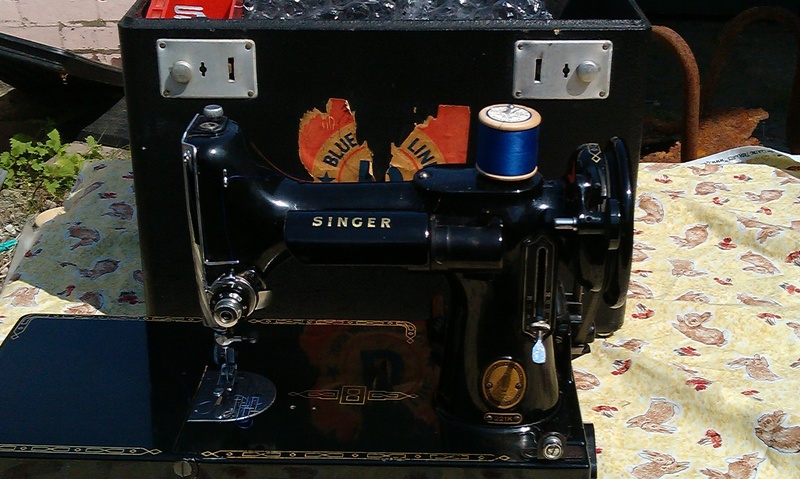 I will assume ‘her’ as professional tailors and seamstresses generally used other, more industrial machines like the Singer 13K: the 12K was the first big household sewing machine. The 12K remained in production for a long time, even though later, better machines superceded it. By 1910, a tailor or seamstress might well want a Singer 66K with its larger harp space, but not the little 12K. So the chances are its earlier owner is likely to have been female, subsequent owners even more likely to have been women. The 12K was originally known as “The New Family” machine, because it was intended for domestic use. Jones had the similarly named “Family C.S” (Cylindrical Shuttle) which was aimed at the same market. A search of Ancestry brings up almost only one family group of people called “Shoppee” in and around London in the late 19thC. Thank the gods the owner wasn’t Elizabeth Smith! An obit in The Daily News for 1897, said that the family’s great grandfather was a Huguenot called “Chapuis”, which may explain the fact I could only find one family group with this name. I can’t be sure which of the female Elizabeth, Emma or Emily Shoppees, over several generations, owned the 1885 Singer but there is a stronger candidate, given the ages and family occupations of some Shoppees, compared to others. If I’m right she is unlikely to have been the first owner, but was an early one. “My” E Shoppee could be a Shoppee by birth or by marriage. Which begs the question – who would be likely to own a Singer 12K made in 1885? 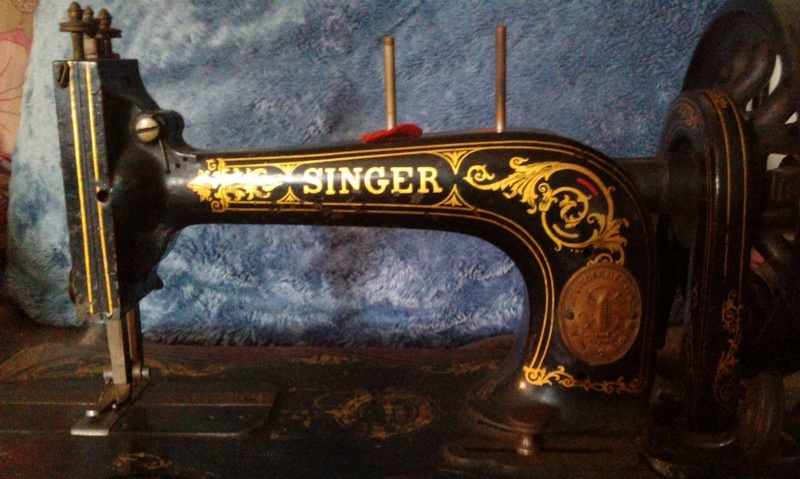 …the finest sewing machine the world had ever seen at the time and the pinnacle of inventive genius from the design team at Singers. It became the world’s best selling sewing machine and kept that predominance til production ended in 1902. In the early years, a 12K would cost an average year’s wages. Singer pioneered the Hire Purchase model of trading, so many people bought their 12K over a period of years. Which democratised the sewing machine as a household item but it still would have been out of the reach, financially, of many people. A charwoman would have been less likely to own a sewing machine, in the early days, than a school teacher. For decades, the sewing machine was the single most expensive item in many a home. These old hand-cranks we can pick up for a tenner at a car boot were once someone’s most treasured possession – it’s easy to forget that. They revolutionised women’s lives, a bit like the washing machine was to do. You can date your Singer machine using its serial number here. Singer numbered every part so if a part of your machine is shot, the chances are you will be able to replace it – and much more cheaply than a modern machine part would cost. The eBay seller had shown the serial number in close up, so I had known the date of the machine before I bought it. Mine has the most common Acanthus Leaves decals but some later ones have the spectacular, and more rare, Ottoman Carnations – which are probably my favourite Singer decals ever. There was also a gilt and mother of pearl roses 12K. Identify your Singer decals here. The Shoppees seem to have been exemplars of that mid nineteenth century urban phenomenon – social mobility. In the early part of the century, they were builders but by the latter end of the century, it was a family of architects and surveyors, doctors and other professionals. London offered more scope for this than most British cities. My favourite candidate for “my” E Shoppee is Emma E. Shoppee, who on the 1901 Census was 26 and living in Hornsey, London with her husband, Joseph W. Shoppee, a London-born Commission Merchant’s Clerk. As the machine dates to 1885, she would not be its first owner but maybe it was passed on to her. It may even have come from her family in York, or the Shoppees in London. As a hand-crank, she’d be able to travel with it. You would certainly want to pass on your sewing machine to a relative or friend. So this one may have come from either her York or her London family, if Emma was the owner. Free BMD told me that Emma Elizabeth Hawkswell married Joseph W Shoppee in the second quarter of 1899 in York. The 1881 Census found Emma E Hawkswell living down the road from me, at 19, Stonegate, York – somewhere in the centre of Stonegate – it must have been re-numbered since – as the Census enumerator veers off down Coffee Yard straight after visiting the Hawkswells’ house. In 1881, Emma lived with her parents, Ralph and Emma. Ralph was a lithographic printer with 3 employees. The Hawkswells, like the Shoppees, were firmly middle class. In 1891, she was still at 19, Stonegate and now a Pupil Teacher, aged 16. Emma married Joseph Shoppee at the Salem Congregational Church in York, June 14th, 1899. On the last available census, 1911, Emma had two children and was living at 38 Womersley Rd with Joseph and her younger brother, Stanley, a jeweller’s shop assistant; still in Hornsey. By 1911, Emma’s father, Ralph was now retired from lithography, now working as an Antiques Dealer, still at 19, Stonegate. I did find several other possible E. Shoppees but they looked less likely than Emma; elderly by 1885, or too young, or had married and lost the Shoppee surname prior to 1885… It is very likely the machine belonged to one of this family. One of the better bets was Elsie Shoppee, a doctor’s daughter, who married Stacey Hammond in 1895. Which would mean she had ten years as E Shoppee from 1885 on. But she was only 6 when the machine was made. Other E Shoppees seem to have been out of the country in the 1880s/90s. One Elizabeth Shoppee died in 1886 – a year after the machine was made – in Uxbridge, aged 63. She was another possibility but a remote one. The machine is almost restored. I really have to bite the bullet now and try and thread up the shuttle and get the needle in the right position. Both of these variables will throw a machine out, so it may need a few hours’ experimentation to get it right. But I will post pictures if and when I get it sewing! This post is in memory of my very dear friend, the supreme living history needlewoman, and Dove Cottage’s own Dorothy Wordsworth, Caro. I never got to tell her the tale of E Shoppee and the Singer 12K. She’d have loved it, though, so this one is for you, Pretty Lady.